We are educators in all we do. Impelled by the Spirit and mission of Jesus, we educate with a global vision believing that the world can be changed through the transformation of persons. Click on the tabs below to view our sponsored and co-sponsored schools serving elementary to university level. Kyoto Notre Dame University is a private university founded by the School Sisters of Notre Dame in 1961 in the ancient capital of Japan. The school offers both under-graduate programs for women and graduate studies for both women and men. Recognized for the excellent quality of its graduates, the university is committed to the development of creative thinking, practical skills and the spirit of mutual cooperation for success in an increasingly global society. Learn more about Kyoto Notre Dame University here. Founded in 1913, Mount Mary University is a fully-sponsored ministry of the School Sisters of Notre Dame. An urban Catholic college for women, Mount Mary Universityty offers a curriculum steeped in liberal arts and provides an environment for the development of the whole person with an emphasis on critical thinking. The college encourages leadership, integrity, and a deep sense of social justice arising from sensitivity to moral values and Christian principles. Visit the Mount Mary University website. Notre Dame of Maryland University, formerly the College of Notre Dame of Maryland established in 1895 by the School Sisters of Notre Dame, achieved university status in 2011. 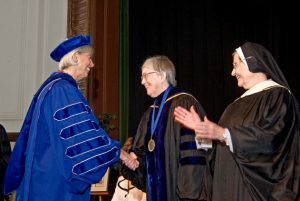 It holds a unique place in the history of higher education as the first Catholic college for women in the United States to grant the four-year baccalaureate degree. 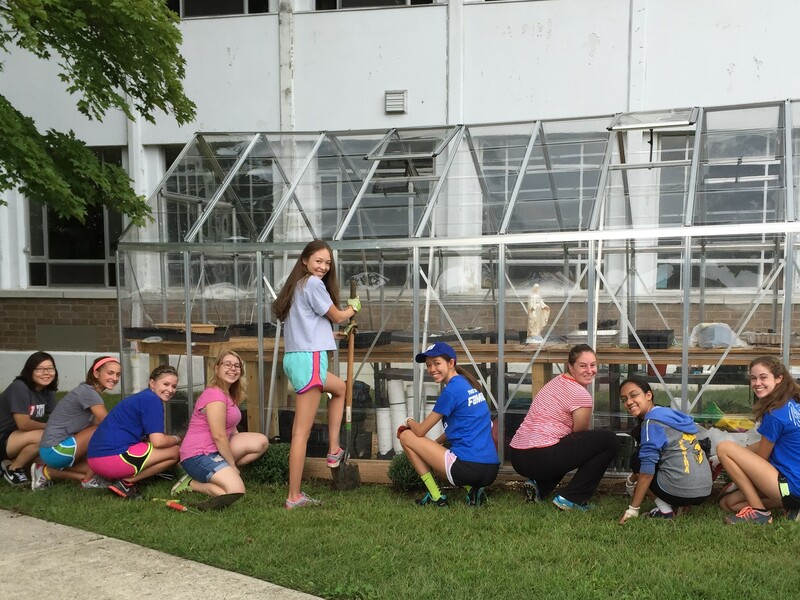 Notre Dame of Maryland University continues to respond to the changing needs of society. Visit the Notre Dame of Maryland University website. The Academy of the Holy Angels, founded in 1879, is a 9-12 Catholic college preparatory school for girls, sponsored by the School Sisters of Notre Dame and dedicated to academic excellence in the education of young women. Grounded in the gospel message and in the tradition and charism of the School Sisters of Notre Dame, the Academy welcomes all students and appreciates the uniqueness of each individual while working towards the fulfillment of Jesus Christ’s prayer “that all may be one.” Visit the Academy of the Holy Angels website. 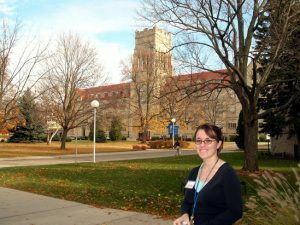 The Institute of Notre Dame, established in 1847 by the School Sisters of Notre Dame, is a Catholic high school for girls that is committed to a philosophy of education inspired by Blessed Theresa Gerhardinger, foundress of the School Sisters of Notre Dame. Believing that each student is created in the image of God, IND strives to develop the fullness of her potential and help her understand her relationship to the world. Visit the Institute of Notre Dame website. Notre Dame High School’s roots reach back to 1897 when the School Sisters of Notre Dame founded Sancta Maria of Ripa High School (currently, Notre Dame High School). 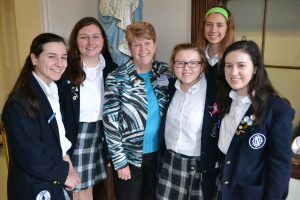 NDHS educates young women to become confident, compassionate Christian leaders. Each student is guided to reach the fullness of her potential and to use her gifts to make a difference in the world around her. Notre Dame High School provides a college preparatory program to girls from diverse backgrounds through an environment of differentiated instruction. In the spirit of the School Sisters of Notre Dame and in response to the mission of Jesus in the Catholic tradition, students are educated to integrate lifelong learning, faith, and service into their lives. Visit the Notre Dame High School website. 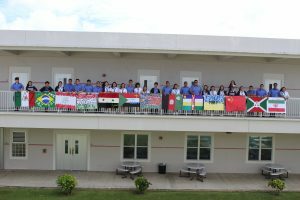 Notre Dame High School, Inc. is a Catholic Coeducational Secondary School established by the School Sisters of Notre Dame in Guam in 1968. NDHS prepares students for college and lifelong learning in an environment that encourages collaboration, instills leadership, promotes dedication to service and inspires passion for justice and peace in the spirit of Jesus Christ. Visit the Notre Dame High School website. Responding to the needs of the poor in one of the least-developed countries in the world, the School Sisters of Notre Dame established the Notre Dame Higher Secondary School in Bandipur, Nepal. The school offers education in nursury (kindergarten) through class twelve. While 10th grade is considered the end of high school in Nepal, in 1997 the school began offering higher secondary education (class 11 and 12) in science. Upper grade students reside in hostels to insure safety and supervision for students who travel great distances to study at Notre Dame. Follow Notre Dame Higher Secondary School on Facebook. In 1948, after World War II, Japan was in a period of severe need. It faced a shortage of material goods and a confusion of values. Four sisters were sent from SSND, St. Louis, Missouri, to Kyoto, answering a call for a school for girls which could teach universal values. In 1952, Notre Dame Jogakuin Girls’ Junior High School (7th grade to 9th grade) was opened, followed by a senior high school (10th grade to 12th grade) in 1953. This year the school will be celebrating its 65th birthday. Currently, there are 600 students enrolled and over 10,000 graduates all over the world, as well as in Japan, working in various ways for the betterment of mankind. We continue our mission of helping our students attain the full blossoming of their potentials. Visit the Notre Dame Jogakuin website here. A Catholic, independent, all-female college preparatory school, Notre Dame Prep was established by the School Sisters of Notre Dame in 1873. Notre Dame Prep educates and inspires young women in an academically rigorous, spiritually nurturing and service-oriented environment. The school, with grades 6-12, offers a multi-phased approach to learning, which ensures that each student progresses at the level and pace that is appropriate for her. Visit the Notre Dame Preparatory School website. Marian Middle School, a co-sponsored ministry of the School Sisters of Notre Dame, was founded in 1999 by seven women religious communities seeking to educate young urban adolescent girls and provide them with a holistic, college-prep, faith-based education. It is committed to breaking the cycle of poverty by fostering the spiritual, academic, social, moral, emotional and physical development of middle school girls. The Religious Congregations that sponsor Marian Middle School are the Ursuline Sisters of the Roman Union, the Sisters of Loretto/Loretto Community, the Sisters of Saint Joseph of Carondelet, the School Sisters of Notre Dame, the Daughters of Charity of Saint Vincent de Paul, the Franciscan Sisters of Our Lady of Perpetual Help, the Sisters of the Most Precious Blood and the Benedictine Sisters of Perpetual Adoration. Visit the Marian Middle School website. Mother Seton Academy is a co-ed, tuition-free middle school that offers a quality education to children who come from low income families. The Sponsoring Congregations of Mother Seton Academy are the Daughters of Charity, the Marianist Province of the United States, the School Sisters of Notre Dame, the Sisters of Saint Francis of Philadelphia, the Sisters, Servants of the Immaculate Heart of Mary, and the Xaverian Brothers. In 1993 these six religious communities began Mother Seton Academy because they believed that the only way out of poverty for young urban men and women was to come together and give the gift of an education. Visit the Mother Seton Academy website. Notre Dame Gakuin is an elementary school in Kyoto, Japan, established in 1954 by the School Sisters of Notre Dame. This highly respected school for first- through sixth-graders serves both boys and girls. 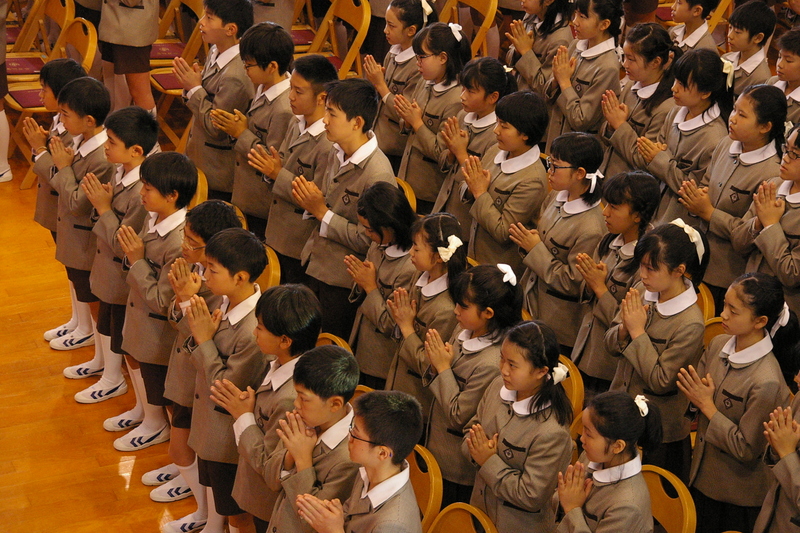 Each morning, the students begin their day with prayer: “Lord, help us to think clearly, to judge correctly, and to put our decisions into actions that will please you.” Older students have opportunities to participate in cultural exchange programs to enhance their perspective of the world and appreciate their role as a global citizen. 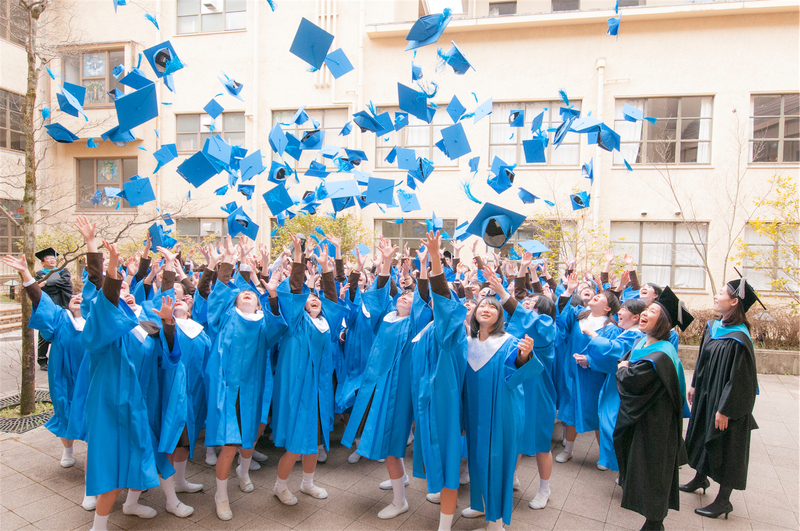 Learn more about Notre Dame Gakuin here. Notre Dame Secondary School (Jogakuin) was established in 1952 by the School Sisters of Notre Dame. This all-girls school for junior and senior high school students begins and ends its day in prayer, focusing on the education and wellness of the whole person. Visit the Notre Dame Jogakuin website here. Notre Dame School in Bandipur, Nepal was opened in 1985 by School Sisters of Notre Dame sisters from Japan. From its humble beginnings without electricity, telephone or proper teaching materials, it now has become a highly recognized school in the country, educating over 800 boys and girls from kindergarten (nursery) to class 12. While classes are taught in English, students must demonstrate competency in Nepali and pass national examinations at the end of grade eight to continue in the higher levels. Notre Dame School of Milwaukee is sponsored by the School Sisters of Notre Dame and is made up of two campuses: a K4-4th grade, co-educational, primary school and a 5th-8th all-girls middle school. Following in the Christian tradition, Notre Dame fosters respect, responsibility and sharing of personal talents while preparing students for admittance to a college preparatory high school. In an English and Spanish bi-literate setting, emphasis is placed on leadership skills, critical thinking and social justice while empowering students to make positive contributions to society. Visit the Notre Dame of Milwaukee website. Sisters Academy of Baltimore is a Catholic, community-centered middle school for girls of diverse races, ethnic groups and religions and who are from families of limited economic means, particularly those of southwest Baltimore. The Academy empowers its students to become agents of transformation in their families, communities and society. 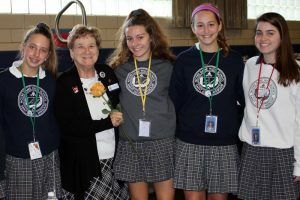 The Sponsoring Congregations of Sisters Academy are the School Sisters of Notre Dame, the Sisters of Bon Secours, the Sisters of Mercy and the Sisters of Notre Dame de Namur. Visit the Sisters Academy of Baltimore website. In response to the needs of poor, working mothers, a child-care program was started in 1992 near the Notre Dame Higher Secondary School in Bandipur, Nepal. Seto Gurans, an early learning center for approximately 100 children, aged eighteen months to four years, promotes effective child-rearing skills and health awareness for parents. It has produced countless eager learners who are better prepared to begin their studies in the Notre Dame School nursery class. 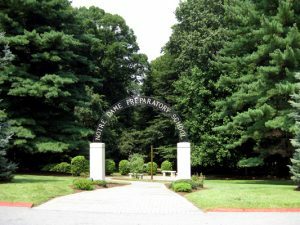 Notre Dame School, founded in 1963 by the School Sisters of Notre Dame, provides a quality education to students (ages 6-21) with a diagnosis of mild to moderate mental disabilities. Through this education, the school strives to facilitate each student’s integration into society. Notre Dame is guided by the firm belief in the dignity of each person as a child of God. 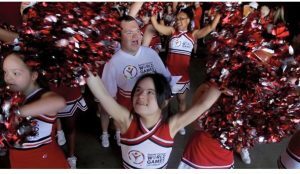 Notre Dame School is the only independent school in the Dallas area devoted exclusively to educating children with developmental disabilities. Visit the Notre Dame School of Dallas website.